Meet Jaywalker (who is white and blue). This cute little budgie has had a chaotic life, so far. 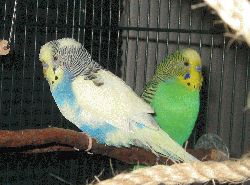 His owner died unexpectedly so he went to live with a relative, who didn`t know how to care for budgies. So a kind neighbor took him in, but the neighbor`s house burned down. And then Jaywalker`s pal Ruffian (the green budgie in this photo) up and died. So here he is, a very cute little bird who is ready for a forever home with a lot less excitement. He has a new name to mark this new start in life -- kind of a whimsical name for a budgie, since whatever other trouble he gets into, jaywalking isn`t usually it (except maybe for scrub jays).